In 2016 and 2017, the Mainz Institute for Theoretical Physics has further established itself as an international center for theoretical research in particle, hadron, atomic, and mathematical physics in Germany. 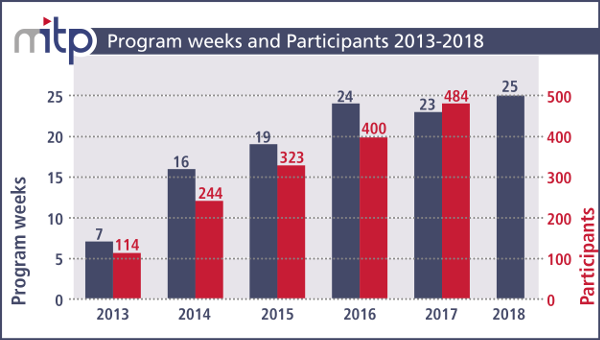 Both the number of scientific activities and of participants have increased since 2013. Compared to 16 weeks in 2014, 19 weeks in 2015, and 24 weeks in 2016, we have scheduled 23 weeks of Scientific Programs and Topical Workshops in 2017. While we had 244 scientists participating in the MITP activities of 2014, there have been 353 participants in 2015, 400 in 2016, and 484 in 2017. The participants of the last two years came from 42 different countries, more than 70% from outside Germany. During the past two years, we annually received close to 20 proposals for Scientific Programs and Topical Workshops from external scientists, which amounted to approximately 40 weeks of scientific activities. The number of applicants has also increased constantly. We had 400 applicants in 2014, 428 in 2015, 554 in 2016, and 655 in 2017. 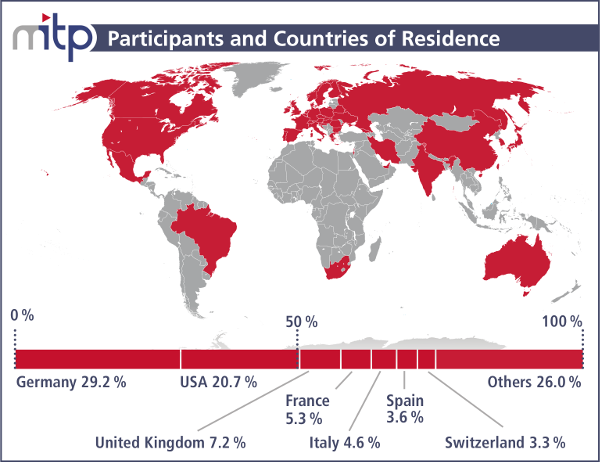 The impressive response to the MITP call of proposals and the increasing number of applicants for MITP activities demonstrate the high acceptance of MITP as a theory center by the international community and the need for such an institution in the center of Germany.